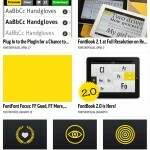 FontBook™ – The Original Typeface Compendium, est. 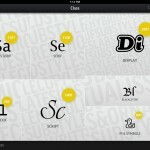 1989 ($5.99) by FSI FontShop International GmbH is a must-have app for any typography nerd. I may not need to deal with fonts for my work — I just need to get the right words out — but I have come to develop an appreciation for fine typography over the past few years. 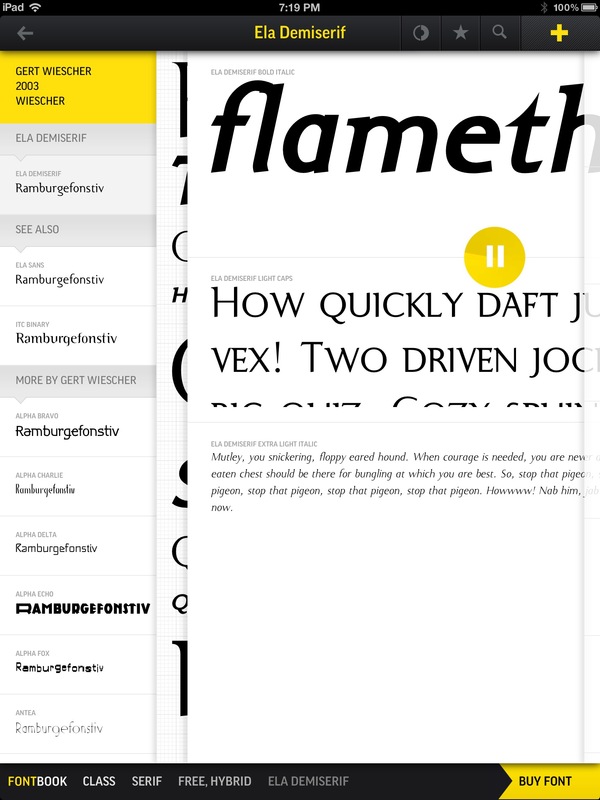 Combine that with impeccable taste for good design, and you’ll end up with this app — FontBook. 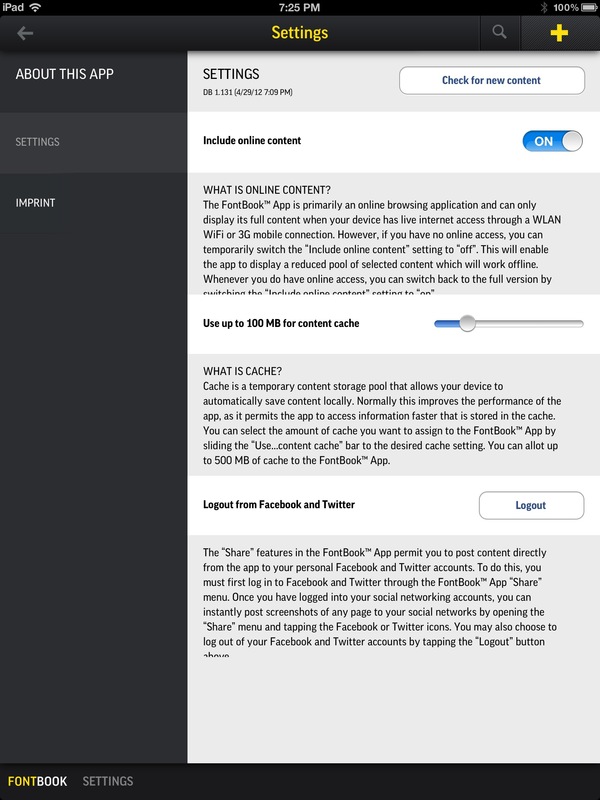 The main screen of the app will be the “home screen,” if you will. 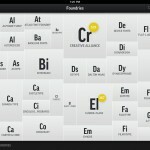 It consists of tiles for navigating each section of the app. 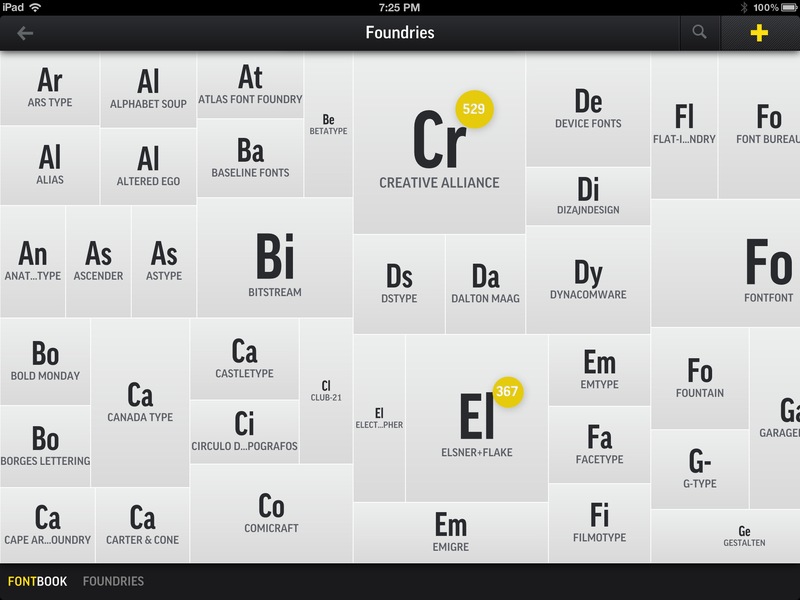 From this screen, you will have: Class, Font Name, Usage, Year, Foundry, and Designer. 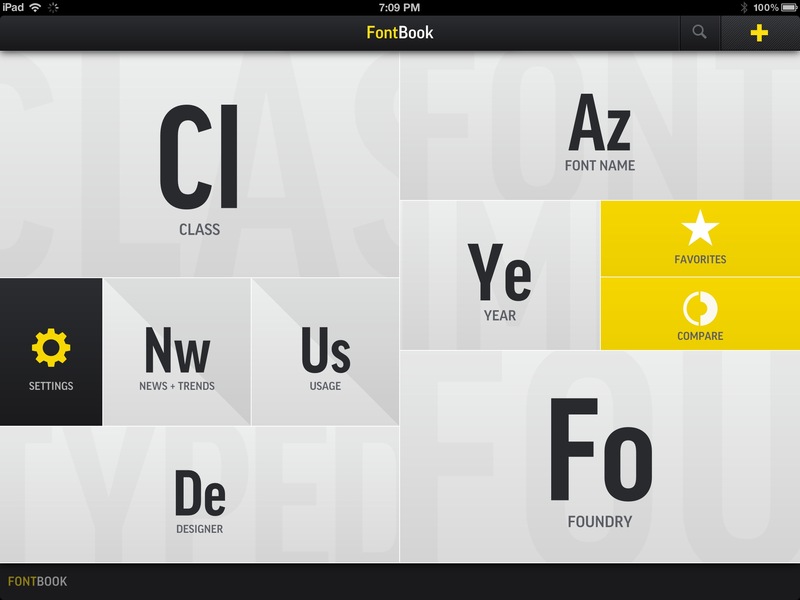 There are also other sections you can access, such as News + Trends about FontBook, Compare [fonts], and even your Favorites. 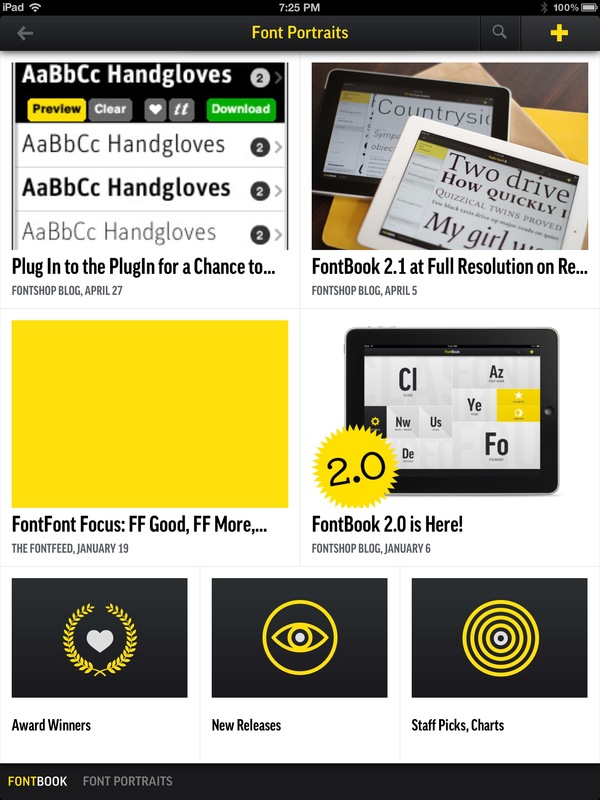 FontBook even has a few settings that you can access, including toggling online content, checking for new content, and how much the app should save in its content cache. 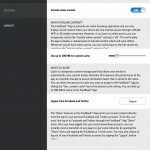 There is even the option to look for a specific font by searching for it, and you can even share the current screen via Facebook, Twitter, email, or save to your Camera Roll. 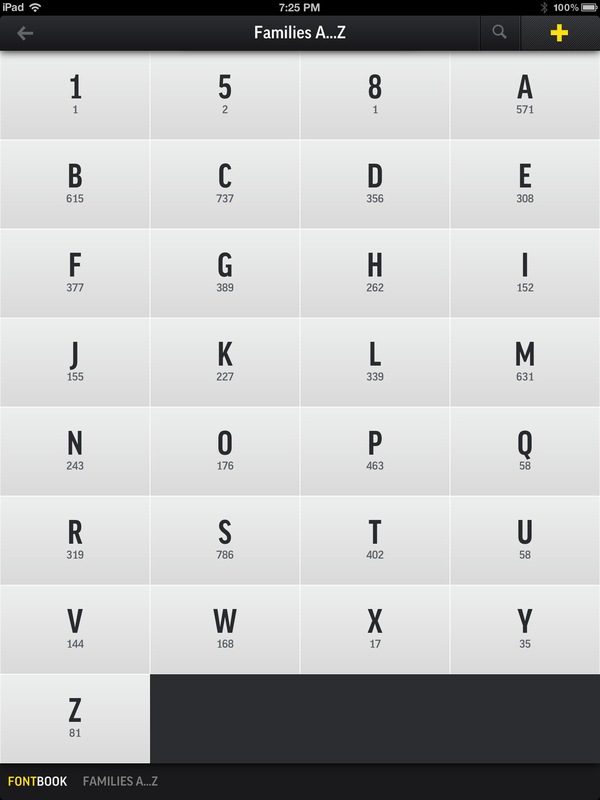 Once you start navigating through the various sections, you’ll basically be drilling down to the fonts. 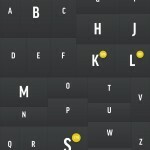 Selecting a tile will basically zoom in on it and take you to the next level, which will also be composed of tiles. 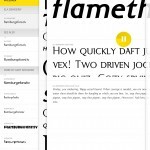 The app has a database of over 700,000 typeface samples through 118 type foundries, 1650 type designers, and 8050 font families for a total of 35,000 fonts — there’s definitely no shortage of amazing typography in this app. 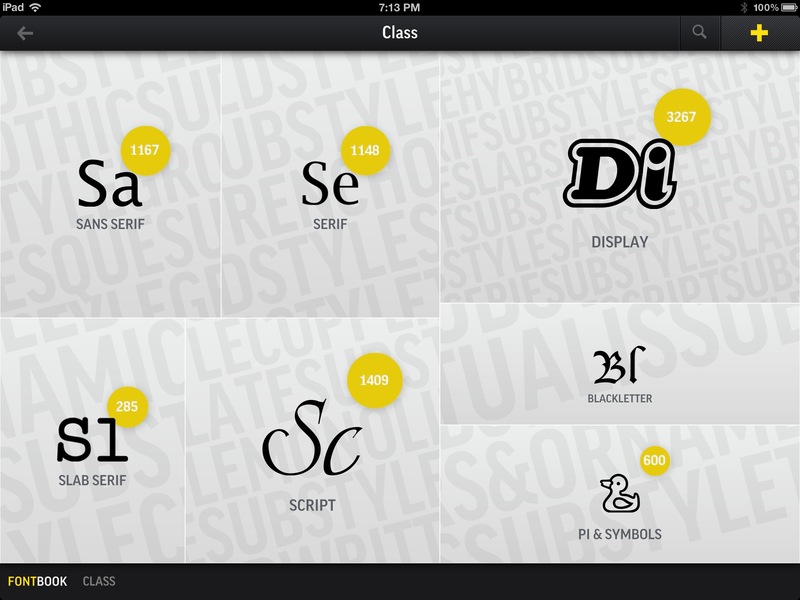 One of my favorite views in FontBook is by the Class. 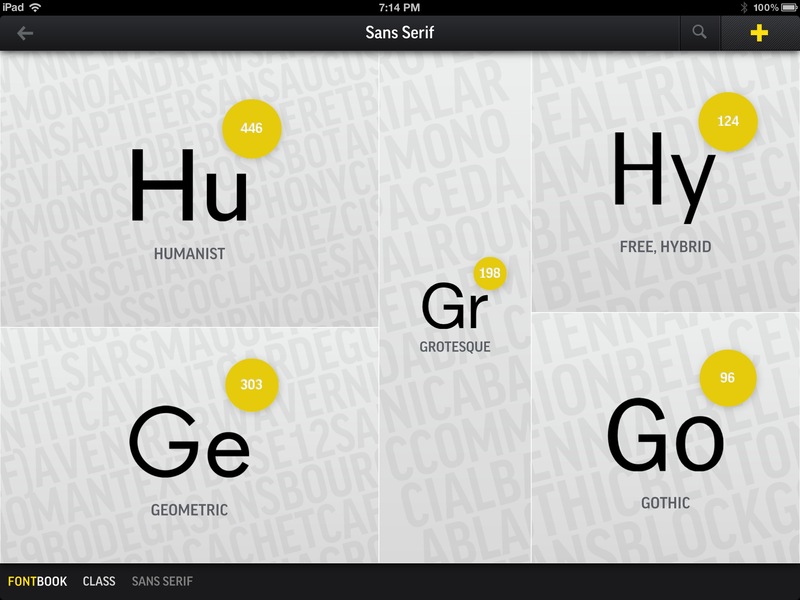 This view displays the seven classes: Sans Serif, Serif, Slab Serif, Script, Display, Blackletter, and Pi & Symbols. 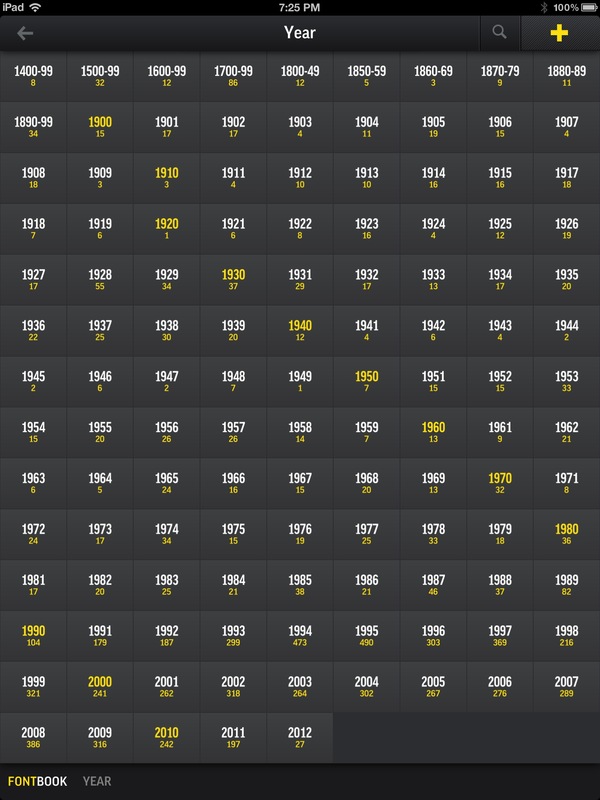 There is also a number count for how many typefaces are contained in each class, as well as each subsequent subclass. 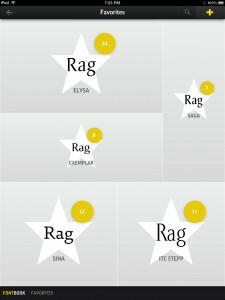 When you get down to the fonts in each view, they are shown as small tiles displaying a sample of how the font looks (with the word “Rag”), and are arranged alphabetically. 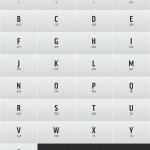 The name of the typeface appears underneath, so you can quickly see what it is. 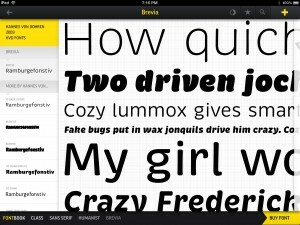 As you select a font, you are able to view samples of that font, see the various styles of that particular font, and the app will also recommend some similar fonts. 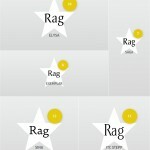 Swiping from right-to-left will bring up another sample view, this time with different font sizes and styles so you can inspect it carefully. 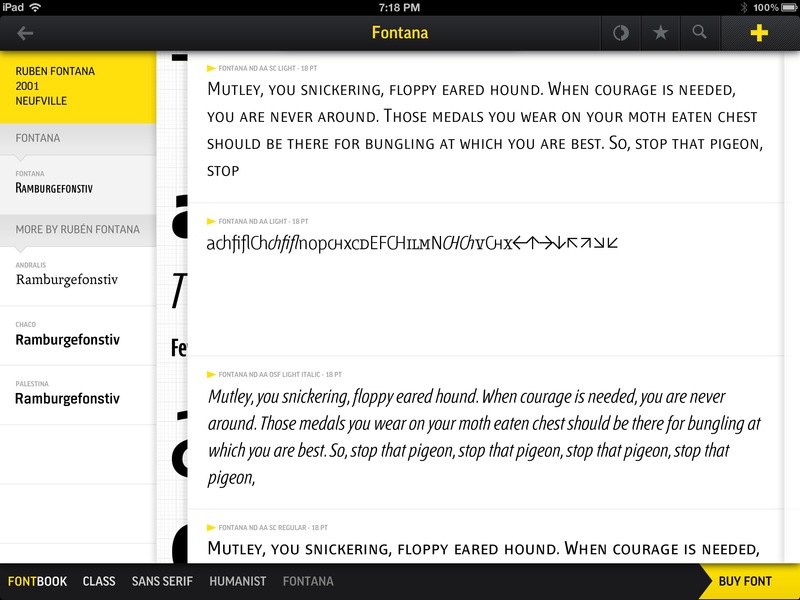 You can even view how the individual characters look, and get more information about the font at the very end. 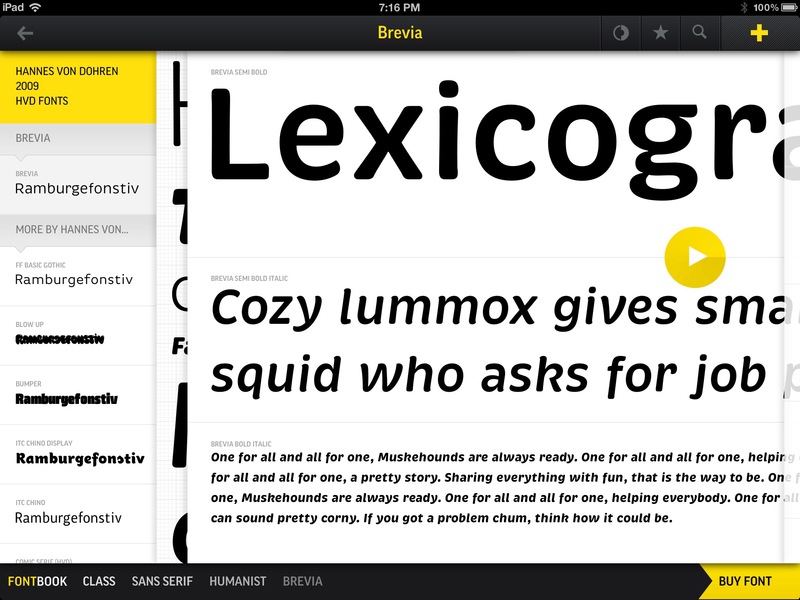 Any font can be added for future comparison (represented by the circle icon) or your favorites, which are both accessed from the app’s main screen. 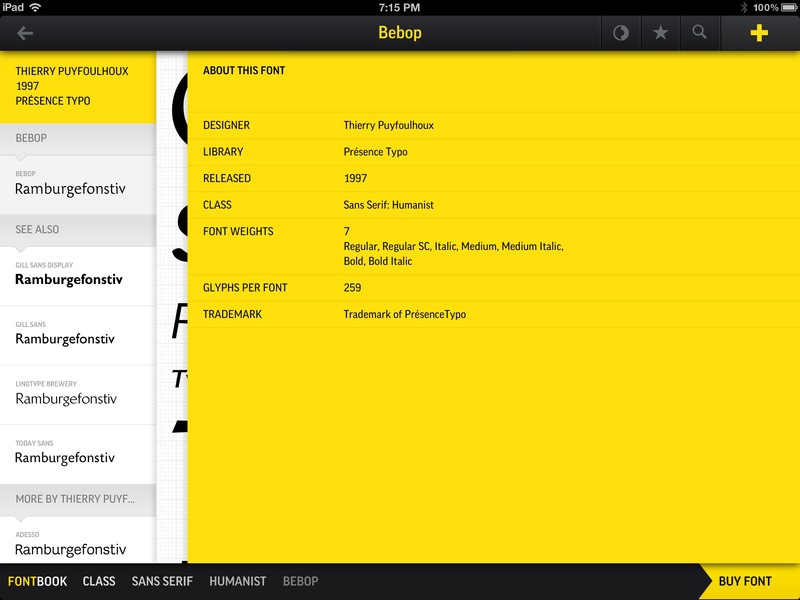 If you find a font that you would like to own, the Buy Font option will open up mobile Safari with a link to buy it. 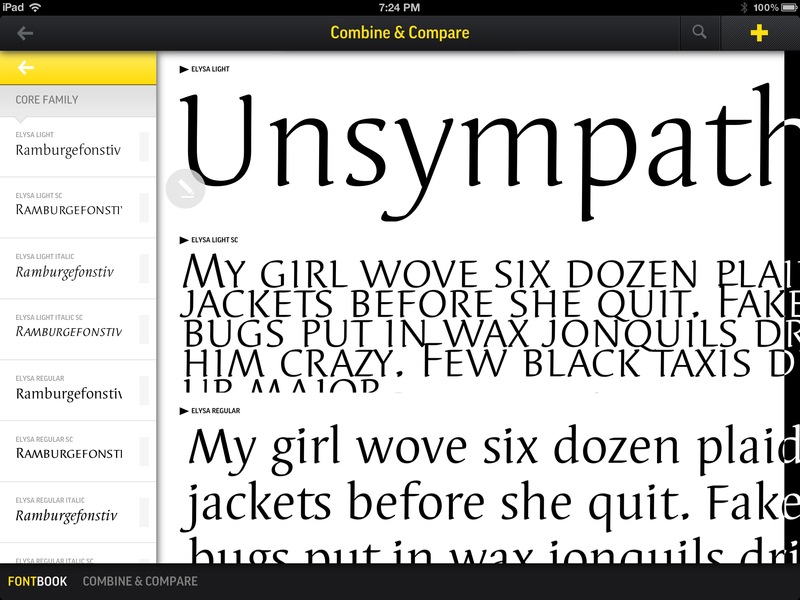 If you’re in the mood to compare fonts to each other, the Compare feature is quite handy. 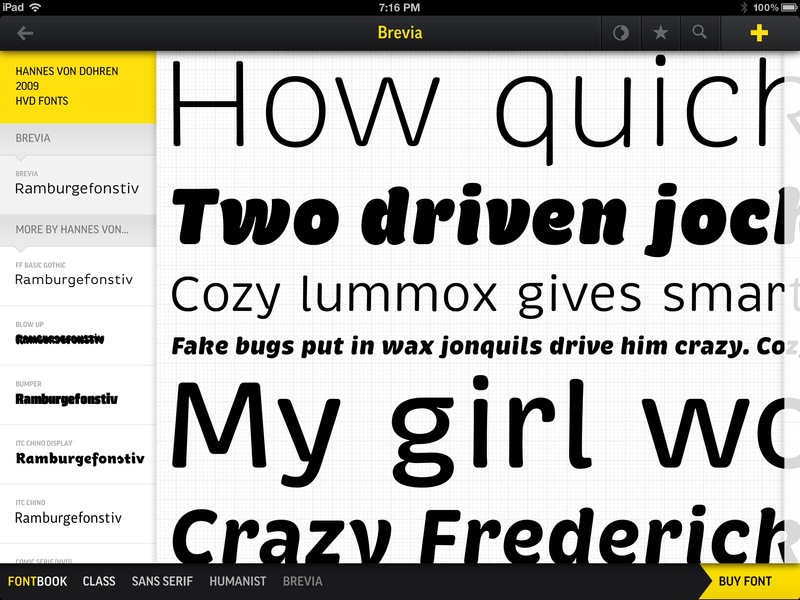 You will be able to choose the core font, view the different styles, and then drag them (up to three) into the comparison panel. 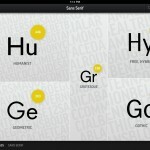 Each compared font will have three sizes — large, medium, and small — to compare to each other, and you can change the background and text color by swiping left and right on a selected font. There’s quite a few choices of colors, and you can also customize the headline text to your liking if needed. 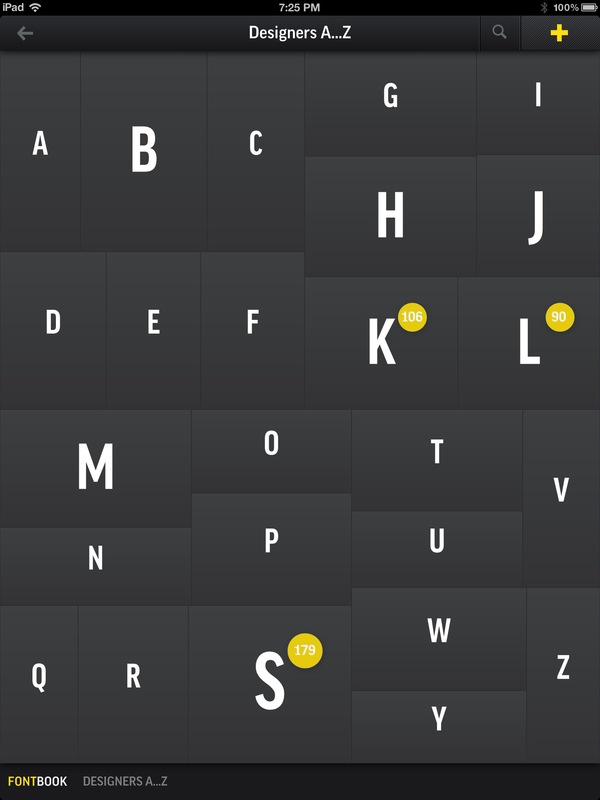 My only small gripe with the app is the fact that it can be difficult to look for certain fonts with the current tile view. 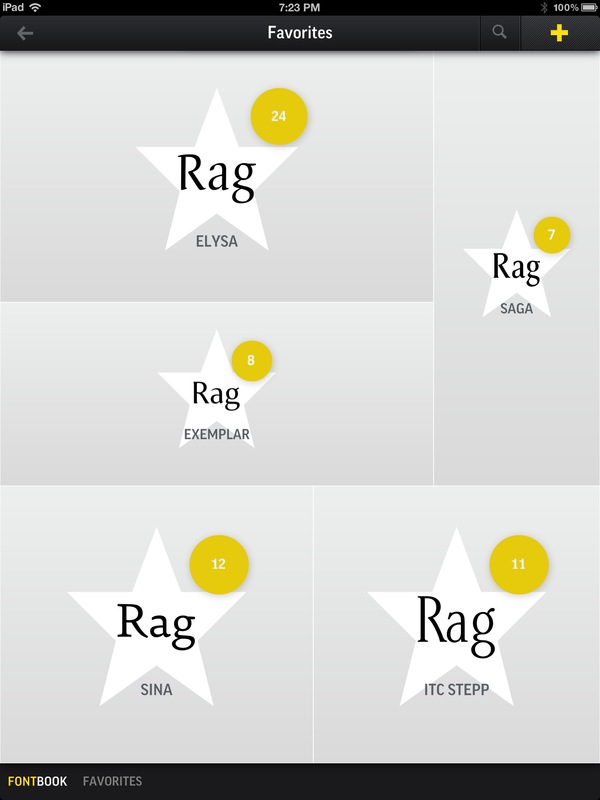 Even though they are in alphabetical order, it is still a bit hard to find certain fonts, since the boxes can also vary in size. 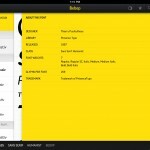 It would be nice to see a list view — it may not be as good aesthetically, but it would make things easier to navigate. 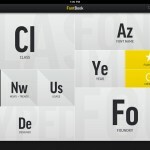 If you are a typography nerd or need a guide to the latest fonts that are out there for your personal projects (a website perhaps), then FontBook is definitely a must-have app. 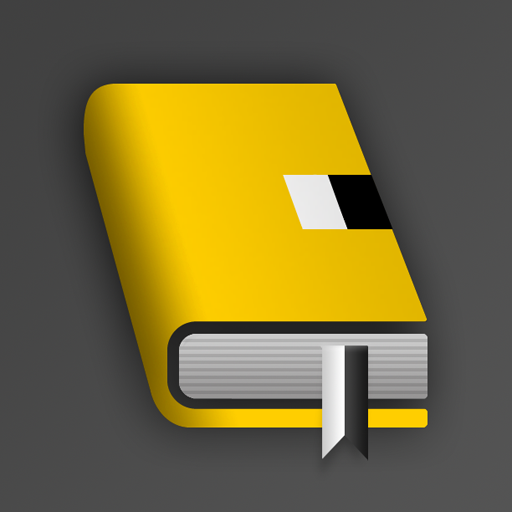 It’s beautifully designed with Retina-ready graphics and is packed with lots of useful information. Check it out in the App Store.